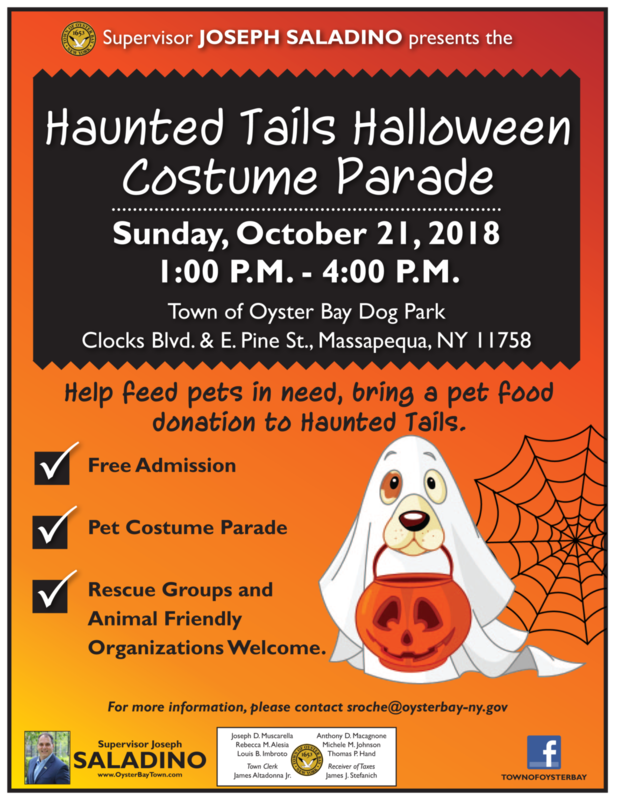 Oyster Bay Supervisor Joseph Saladino and the Town Board today announced a free Haunted Tails Halloween Costume Parade will take place on Sunday, October 21st from 1:00 p.m. to 4:00 p.m. at the Town of Oyster Bay Dog Park, located at the intersection of Clocks Boulevard and E. Pine Street in Massapequa. The parade and costume judging, open to all well-behaved pets, begins at 2:30 p.m. Participants are asked to bring a pet food donation to be donated to LI Cares to help families with pets facing difficult financial times. The event will be held rain or shine and all pets must be on a leash. Rescue groups and animal friendly organizations are welcome to celebrate.